Today marks two weeks until I’ll be in Hollywood for the TCM Classic Film Festival, the premier event for old movie lovers I’ve been dreaming of going to for years. In the past, the dates for TCMFF just didn’t work out for me between school and now work, but fortunately, the stars aligned in my favor this year, which also commemorates TCM’s 25th anniversary. And as an added bonus, I’m back living in my home state of California so getting to Hollywood will be much easier, so I’m sure I’ll be able to head to the festival in the future, even if it’s just going to a few screenings for a weekend. As for this year, it’s now been a week since the full schedule for the 10th annual TCMFF was released, and since then I’ve been constantly thinking over what I want to see for my first time attending. After much consideration, this is what I’ve come up with, though I wouldn’t be surprised if I ended up changing my plans at a moment’s notice. The first night of the festival is already off to a tough start, with so many great movies to choose from! My Classic Pass doesn’t allow me entry to the opening night film When Harry Met Sally… at the TCL Chinese Theatre, but I do want to watch the red carpet for a bit since it’s my very first TCMFF and I’d like to experience it in case this is my only chance. That means I won’t be dropping by the opening night party, but there will be a few other meet-up events earlier in the day, so I don’t mind skipping it. I’d like to leave the red carpet area before 6 to see if I can get into Gentlemen Prefer Blondes at the Egyptian Theatre, and I’m hoping I can make it over to the Chinese Multiplex for The Umbrellas of Cherbourg after. But if I don’t make it to Gentlemen Prefer Blondes, I may opt to see the poolside screening of Ocean’s 11 at the Hollywood Roosevelt Hotel instead, which also means I’d be missing The Umbrellas of Cherbourg. This night would be my only good chance of catching a poolside screening at the festival, and I am curious to see what it’s like. Plus Angie Dickinson will be there, so while I’d be bummed seeing two of my favorite colorful musicals on the big screen, it wouldn’t be a complete loss! Though I may just stick around for the opening discussion then get in line for The Umbrellas of Cherbourg. The other movies I would’ve loved to catch are Dark Passage and the nitrate screening of The Bachelor and the Bobby-Soxer. Initially, I was planning to watch the hand and footprint ceremony for Billy Crystal for the unique experience, but staying for the whole thing might be a little too tight to go see Sleeping Beauty, which I’m assuming will be a popular turnout. Instead, I’ll start my morning with Merrily We Go to Hell, which is the movie I’m most looking forward to seeing for the first time at TCMFF anyway, so it works out! Plus I might be able to catch some glimpses of the ceremony as I leave the Chinese and make my way to the Egyptian. 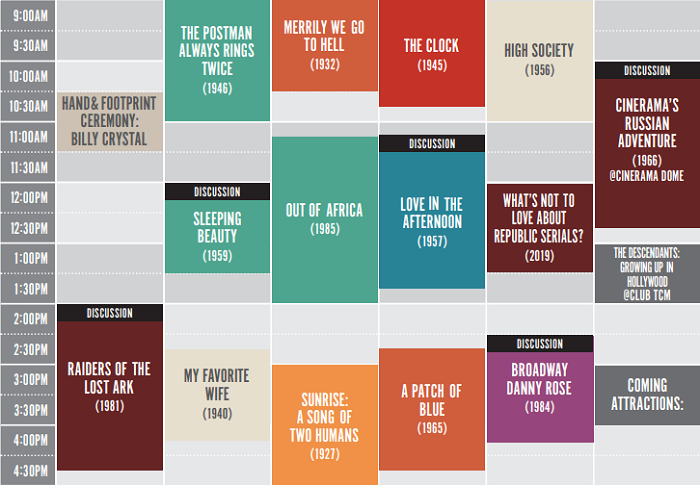 One of my top priority movies for TCMFF (perhaps even my #1) is Sunrise: A Song of Two Humans, so that gets my pick. Fortunately, the screening for Sleeping Beauty at the Egyptian Theatre ends early enough that I’m sure I’ll be able to get a good bite to eat before standing in line for Sunrise: A Song of Two Humans at the Chinese Multiplex. The other screening I would have considered is Raiders of the Lost Ark with discussion from Ben Burtt and Craig Barron. My Favorite Wife and A Patch of Blue would be good choices for me too at a different time. Friday evening puts me in a bit of a tough spot, where I’m really choosing between two movies in each block. Day for Night is one of my all-time favorite movies, and I’d love to see a Truffaut movie on the big screen, plus star Jacqueline Bisset will be there. But I’ve never seen Steel Magnolias, and star Shirley MacLaine, along with screenwriter Robert Harling, will be there, so that’s where my pick goes. For the next block, it’s between Do the Right Thing and Desert Hearts. Recent Oscar winner Ruth E. Carter will be at the screening for the former, while the director and cast will be at the screening for the latter. What I ultimately end up picking will probably just depend on what I’m in the mood for at that time, but for now, I’m leaning toward Do the Right Thing. 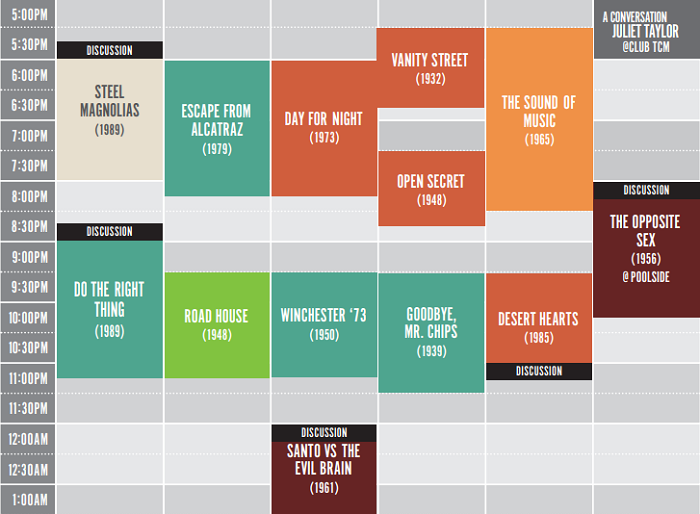 The other movies I would’ve been interested in catching are the nitrate screening for Road House and Winchester ’73 (sadly the only James Stewart movie playing at TCMFF this year). And if I’m still up for it, I’ll check out the midnight screening of Santo vs. the Evil Brain, a movie I’ve never heard of until it showed up on the schedule, but it’s sure to be a fun experience. The first block of the day offers a few good choices of movies I haven’t seen before. I’m debating between When Worlds Collide and All Through the Night. The former features a discussion with star Barbara Rush, while the latter is a Humphrey Bogart movie I’ve been interested in seeing for some time. At the moment I’m leaning toward When Worlds Collide, but it’s another instance where it could come down to what I’m in the mood to see at that time. 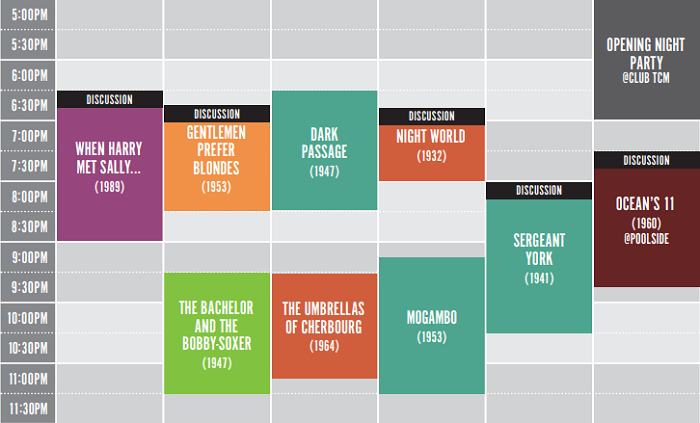 Before the full schedule was released, Kind Hearts and Coronets was on my radar, as it’s one of my underrated favorites, but this second block has a couple of other offerings that I’m gravitating a bit more toward instead, which for me are A Woman Under the Influence featuring a discussion with star Gena Rowlands and “Fox: An Appreciation”. For now, I’m picking the latter as one of the programming themes of TCMFF revolves around the studio, and it’d be interesting to see some of its great movie moments (especially in light of Disney’s recent Fox acquisition). The third block of the day finally allows me the chance to see one of the many Cary Grant movies playing at TCMFF (though I hear he has a small appearance in Merrily We Go to Hell), and it’s one I haven’t seen before! So Father Goose is an easy choice for me, though I would’ve loved to see Love Affair, which was one of my early picks before the schedule was released. 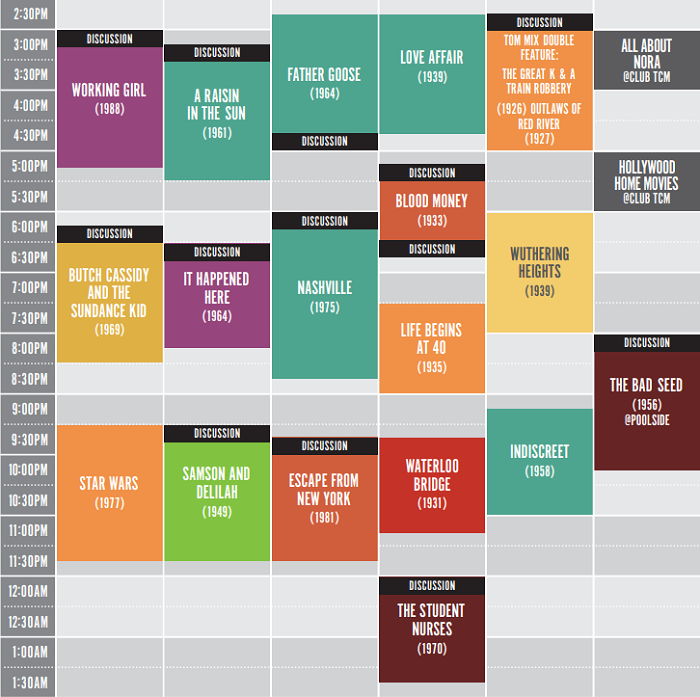 The toughest section of the whole festival for me comes right after, with Butch Cassidy and the Sundance Kid vs. Nashville, followed by Star Wars! Butch Cassidy and the Sundance Kid was another one of my early picks, but Nashville is a movie I’ve been wanting to revisit, and four of the cast members will be there (including Jeff Goldblum). The line for that screening is sure to be long, but probably not as long as Star Wars. That one is my other top priority of the festival, as Star Wars means so much to me. It’s up against some great contenders though, and I hate having to pass up the likes of Indiscreet, the nitrate screening of Samson and Delilah (one of the movies I hoped to discover at TCMFF), and Escape from New York with star Kurt Russell and director John Carpenter. My dilemma comes with if I should try to catch Nashville and then book it over to Star Wars, or go see Butch Cassidy and the Sundance Kid so it’s not as much of a hassle leaving and going right back in line for the same theater. Or if I should just skip that whole block altogether and give myself time to line up for Star Wars… deciding between so many great options is so difficult! For now, I’m picking Butch Cassidy and the Sundance Kid over Nashville just so I at least have an hour to get in line for Star Wars as opposed to 45 minutes. But I may end up going to Nashville just for the discussion, then either head to Butch Cassidy and the Sundance Kid or start waiting in line for Star Wars… we’ll see what happens when the time comes. Depending on how I feel after (hopefully) seeing Star Wars, I might end up skipping the midnight screening for The Student Nurses just to end on the high of seeing Star Wars at the TCL Chinese Theatre in IMAX. I’ll stick it on my list anyway though, also in case I end up skipping Friday’s midnight screening. The first half of the last day of TCMFF is refreshingly very flexible for me. There’s definitely a few favorites in this section, but they’re not necessarily ones I have my heart set on seeing. It will really all depend on the TBA titles, which I imagine will be what I end up picking over what’s on the schedule already. If not, I’ll likely go see Holiday, which actress Diane Baker will be at. I could also be swayed to see The Defiant Ones instead or go to the screening for Mad Love purely because Bill Hader will be there. Again, it will all depend on what I’m in the mood for. For these next two blocks, I’m going to take it easy and head over to Club TCM at the Hollywood Roosevelt Hotel for the panel discussions “Hollywood Love Stories and Celebrity Culture” and “The Complicated Legacy of Gone with the Wind”, barring a good TBA title of course. Plus between the two events, there will be a TCM Backlot meetup at the hotel, so all the more reason to stick around. But if I decide to go to more screenings instead, it’d be Magnificent Obsession, then either Marty or The Killers with star Angie Dickinson, the latter of which may depend on if I end up seeing her at the Ocean’s 11 screening. 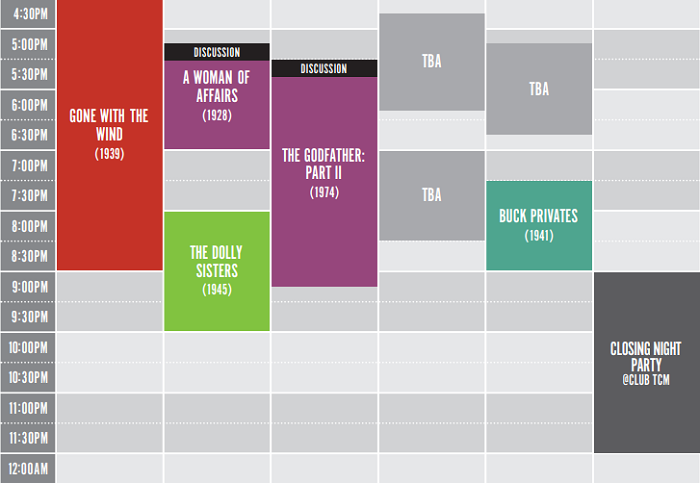 I plan on ending my first TCMFF with two movies I haven’t seen before: A Woman of Affairs and The Dolly Sisters. It’s not often that one sees a silent film in theaters and one starring Greta Garbo and John Gilbert no less! And seeing The Dolly Sisters finally gives me the opportunity to see one of the festival’s four nitrate screenings, and ending TCMFF with a Betty Grable musical is a fun way to go out. That’s all followed of course by the closing night party at the Hollywood Roosevelt Hotel, where I’m hoping to meet the TCM hosts if I haven’t run into them by then. I don’t forsee my plans for this last section changing even with the TBA titles, but we’ll have to wait and see what happens! If I end up sticking to what I’ve picked, I’d be seeing 16 movies total at the festival, with half of those being new-to-me movies! But the need for sleep could get the best of me and keep me from going to the midnight screenings, and I may end up skipping Gentlemen Prefer Blondes and/or Butch Cassidy and the Sundance Kid, decreasing the count to about a dozen movies, give or take, which is obviously still a great number of screenings over a four-day period. Either way, it’s sure to be an amazing time! As far as my actual trip to Hollywood, I’ll be in town for about a week, flying in just before noon on Tuesday, April 9th and heading back home early the following Tuesday. My sister will be joining me for the trip, though she will be going the standby route and attending just a few screenings while I try to watch as many movies as I can with my Classic Pass. Fortunately, a lot of her picks line up with what I’ve selected so we should be able to see some movies together. She also has a few other good picks that I would’ve gone to myself if it weren’t for all the other great options. In the meantime, we’re still planning what else we’ll do in L.A., but on the Wednesday before the festival, we’ll be going on the TCM Movie Locations Tour, and on the Monday after we’ve been invited through TCM Backlot to tour the ASC Clubhouse, so that should all be very fun. 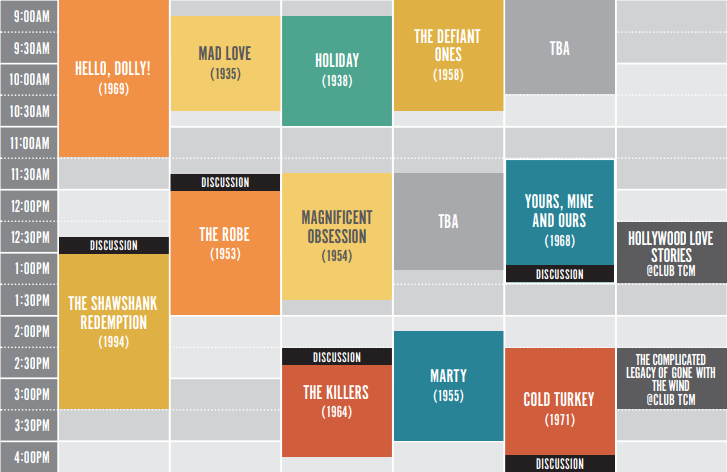 If you’re going to TCMFF, please let me know if any of our picks line up! And any tips on navigating the festival, as well as any recommendations on good places to check out in Hollywood, are all welcome. And of course, you can expect a follow-up post on my experience at the festival. Until then, let’s movie! March 26, 2019 in TCM. Awesome, I’ll be seeing you at a few screenings then! And I’ll be sure to reach out if I need a buddy, thank you. 🙂 Along with all the screenings, I’m excited to meet all the classic movie bloggers, I’ll definitely head to those meet-ups!